We touched down on the island of Sao Miguel around 6:30 am after a pleasantly uneventful and easy flight. As we stepped off the plane we were hit with that delicious and unmistakable ocean breeze that pleasantly signals to your body “Yes, you are on vacation.” After a brief stop at passport control where, unlike the Canadian/US border, they don’t ask where you work, why you are coming, how much money you have, where you are staying, and what your cat’s name is, we collected our bags and walked out into the arrivals area, where we were met by Ana’s cousins Paul Fernando and Pedro, as well as her aunt and uncle Genoveva and Luis. 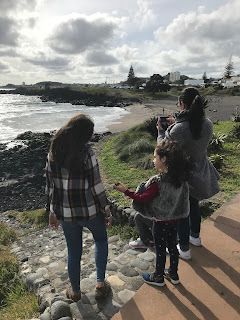 The many months leading up to this trip where I have been diligently practicing my Portuguese paid off as I effortlessly launched into a conversation with them, and we discussed the current state of Azorean politics, new local business activity, recent developments with the Portuguese legal system, and some new initiatives being pursued by the local school boards. In reality, I couldn’t remember how to say “Good morning” so I just stood there sheepishly as Ana caught up on all the news. That first ten minutes is always a real killer. Our rental car provider showed up and drove us to their office in Ponta Delgada, just a few minutes away, and situated right on the Avenida that divides the oceanfront from the downtown core. No, “divides” is the wrong word; it actually creates a wide, inviting, seamless path that connects the downtown with the marvelous waterfront, all of which has been designed for people, not cars. More to come on that topic later, as I have a lot to say about European versus Canadian city design. This is our fifth trip to the Azores, but it’s been six years since our last visit. As we get into the car and pull away, it feels like we have scarcely been gone a month. Everything feels familiar - the roads, the businesses we pass, the shape of the ocean, the feel of the air. Although we have never lived here, it truly does feel like a second home to us, mainly because of the loving, amazing family we have here, but also because this place is such a natural fit for us - from the things we like to do, the way we like to live, and the culture we have developed within our own family that focus so much on family, just like they do here. This is the first time we have visited in the spring - previously we have been here in the summer and once in the winter - so this season will be new for us. We follow Paul Fernando to Ana’s uncle Manuel’s house, which is in the village of Livramento, and is where we will be staying for the duration of our trip. Sao Miguel is a medium sized, whale-shaped island, that can be crossed east to west in about two hours and north to south in fifteen minutes at the fastest part, but don’t let that fool you into thinking there isn’t much here. This island is literally packed with amazing natural sights and so many things to do - incredible ocean vistas, hot springs, volcano crater lakes, remote hiking trails, caves, waterfalls, rivers, diving, fishing, whale and dolphin watching, natural ocean pools, shopping, museums, restaurants, cafes, bars, rock climbing, zoos, bird watching, luscious black sand beaches, sailing, world-class surfing, farmers markets, geothermal cooking (more on that later) and, since our last visit, a casino has sprung up in the downtown core so you can add gambling to that list, if that’s something that cranks your engine. The houses here are all made of concrete, not wood, with most of the finishing done with solid surface materials such as ceramic tile and lava rock. They are also not fitted with heating or cooling systems, so you generally wear your shoes while inside the house because of the cold floors. The interior temperature varies with the exterior temperature, so you regulate your own body temperature with extra clothing instead of extra burned fossil fuels, made possible by living on islands in the Gulf Stream with a mild year-round climate. A large contingent of the family was there to greet us, so we spent a good while visiting, eating and drinking. Some of Ana’s cousins speak very good English, so I spent time talking with them, but also listening in on the Portuguese to try and tune my ear. One of these cousins - Rui, who is a horse trainer and blacksmith and lives and works in Sweden, was home for a visit and took us for a tour of the horse ranch next door - a place he has worked on and off for almost 20 years. The original house was built in the 17th century, and it has been added onto over the years and now has six rooms for guests, all of whom come to learn about horse riding. The kids loved touring the ranch and seeing all the massive horses running around. I’m less enthusiastic about horses, but I did enjoy seeing the magnificent property and grounds, which included tangerine, banana, and avocado trees. “I love taking you out for drinks,” I said. We had our first ocean-view sundowner and it was fantastic. At one point two brave young bikini girls braved the cold ocean water and jumped in for a swim. After our long, rotten, cold Canadian winter, the sight of bikinis on beaches was welcome indeed. From here we walked back home, along the way passing a group of teenage boys in a park, sitting on a picnic bench, playing cards, with no smart phones or devices in sight, something I have certainly not experienced in recent memory. We had a light snack, a beer or two, and then retired for the evening, and settled in for a well needed sleep.